We’ve been going to Kiyokawa to celebrate our wedding anniversary for a few years now. It’s true that we already ate an excellent celebratory dinner this year at Piccolo (in Minneapolis) but tradition is not something to be messed with. Therefore after a pretty good but not particularly exciting lunch at Shunji earlier this trip we repaired to Kiyokawa last week for what turned out to be a pretty epic sushi omakase. There are a number of things that distinguish Kiyokawa from their peers in the upper echelons of the Los Angeles sushi scene. There’s the whimsical approach to platings (seen most clearly in their kaiseki omakase meals); their live sea urchin; being open on Mondays; the ageless Satoshi Kiyokawa’s friendly and relaxed demeanour etc.. The one that I want to note here though is that their menu clearly lists the price of their omakase and what you are going to get for it. This summer the price for the sushi omakase at lunch is $120 and you are told that you will get 18 pieces of nigiri plus a handroll plus two desserts. This is in stark contrast to pretty much every other place where to opt for the “market price” omakase is to not really know how much you will get till the meal is done, or how much you will pay till the check arrives—which is fine for very wealthy people to whom money is no object, but a little intimidating for middle class people making the occasional splurge. So I appreciate it. I also appreciate very much what Kiyokawa’s menu does not tell you but which we have come to expect: that you will receive fish of the highest quality, that none of it will be pedestrian and that great attention will be lavished on every cut—from seasonings to presentation to pairings of fish. And this last point is an important one for people like us who’ve had a decent amount of sushi in our time but are still learning about it. No piece of nigiri comes out by itself: you might get some that are part of a serving of similar or related fish—which allows you to mark distinctions/progressions between them; or you might get the same fish seasoned in two different ways bringing out different qualities. It’s a wonderful gastronomic experience, a wonderful aesthetic/visual experience and a very educational experience. Kiyokawa is not very busy at lunch (they must be packing it in at dinner given rent in Beverly Hills) and if sushi is what you want, I think lunch is the time to go. Be aware though that you need to plan for a long lunch; ours ran almost two hours. If you sit at the bar you will have Chef Kiyokawa to yourself for the most part and he’s a pleasure to talk to—about fish and other things too. Watching him in action, as I mentioned in my review last year, is quite entertaining too—he has a very mannered, ritualized approach to making nigiri. The first course featured a platter of four “white” fish: baby sea bass (suzuki), red snapper (tai), black sea bream/snapper (kurodai) and goldeneye snapper (kinmedai). Baby Suzuki (Sea Bass) from the Mediterranean. Sweet with a slightly springy texture. A very nice, mild first bite. Tai (Red Snapper) from New Zealand. Very similar to the suzuki, with a little less snap and a little more of a briny quality. Kurodai (Black Sea Bream/Snapper). Kurodai is sometimes described as black sea bream, sometimes as black snapper. This iteration, with the skin gently crisped with a blow torch, was a standout on this plate: all the qualities of the first two but intensified. This was also from the Mediterranean. This kinmedai (goldeneye snapper) from Japan had the firmest texture of the four fish, which is not to say it was firm per se. Its skin too was lightly crisped. Very nice. Shellfish duo: Hotate (Scallop) and very recently dispatched Santa Barbara prawn. The sweetness of the Japanese scallop is accentuated perfectly by the grated bottarga. A lovely combination, if probably not very traditional. Here are, or rather were, two of my very favourite sushi fish, Spanish mackerel. Right next to them is the wasabi root from which Chef Kiyokawa grates a bit (with a sharkskin grater) for every piece before he serves it. The Spanish mackerel (from Kyushu, I believe) is served two ways, with the ex-fish keeping a watchful eye on proceedings. In the past I’ve seen Spanish mackerel referred to as Aji, but I believe that’s actually Japanese horse mackerel. Frankly, I can’t remember now if this was presented as Spanish mackerel or as Aji. First with miso. This was a sweeter, more unctuous bite. Then with scallions and fresh ginger. This accentuated the briny, oily notes in the fish along with the sweetness. We both preferred this version, but it was interesting to see how the garnish/seasoning transformed the fish. At this point the heads of the prawns returned. The missus always gets hers deep-fried. And I always get mine in miso soup. Both iterations were very good. Tuna duo: Hawaiian bigeye tuna and albacore from Oregon. 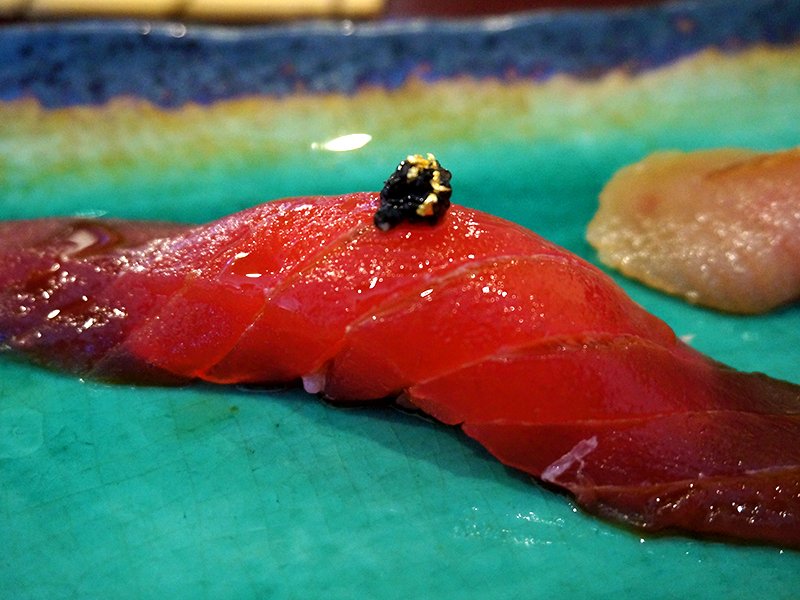 The bigeye tuna is served with a dollop of caviar and a bit of gold leaf on top. Rather decadent presentation (and I took some ribbing for it from friends when I posted a picture on Facebook) but the fish was transcendentally good. Putting in its shadow this albacore which was also excellent, and garnished with crispy onion. Yellowtail duo: inada and kanpachi. The Inada (baby yellowtail) was from Japan—caught less than 40 hours previous, we were told, and arrived at the restaurant a few minutes before we did. Kanpachi (amberjack) from Hawaii, I believe. Amberjack is also a type of yellowtail, hence the pairing. Both of these were excellent—I had the kanpachi in front by a fin. “Salmon” duo with house-smoked salt. The one that looks like regular salmon is in fact wild ocean trout from New Zealand, a member of the salmon family (the trout, not New Zealand). Buttery and lovely. This is Alaskan king salmon. I don’t believe I’ve ever had it as sushi before; I certainly hope to have it again. Chu-toro. Just a perfect piece of fish; great balance between the texture of the meat and the melting unctuousness of the fat. …The Live Uni Cometh. As mentioned before, they are known for their live Santa Barbara sea urchin—we can never resist it. …and black truffle shaved on top of the melted truffle butter. Just exquisite. Each urchin produces five lobes of roe/gonads. We managed to divide them up without coming to blows. Dashi Marinated Ikura (Salmon Roe) on Rice. This is the penultimate course of the omakase proper and the perfect follow-up to the uni (it’s quite common for uni and ikura to be served in close proximity like this). And the omakase came to an end with this blue crab handroll. Unlike at Kiriko the crab is not shredded nor is mayo a key player. Fresh and sweet and great. …a large box was placed in front of us; we opened it to find this exquisite quartet: green tea rusk; Earl Grey pannacotta; fresh house-made mochi with pineapple compote; and raspberry “cheesecake”. Four different textures, four complementary flavours—a lovely end to a great meal. The mochi in particular was just great—light to the point of being ethereal and the compote was lovely. And those who know my hatred of Earl Grey tea will be shocked to hear that the pannacotta was great too. This quartet is the best dessert course we’ve had here by far and put to shame the desserts we’ve been eating at the better high-end restaurants in the Twin Cities. A wonderful meal all around and taken from beginning to end, the best overall sushi experience I’ve had. I should add that the live uni is not part of the omakase; he subbed it in for us as he knows we look forward to eating it each year (and when the bill came we learned that they’d not charged us a supplement for the substitution). Other than the live uni I thought the following were standouts: kurodai, hotate, both iterations of the Spanish mackerel, the bigeye tuna, the albacore, the kanpachi, the king salmon, the ocean trout and the chu-toro. But there wasn’t a single piece of fish that wasn’t at least very good. And the desserts were great too. Frankly, for the price I don’t think you can do better in this city. We’ll be back again next year. A quick note before I go: while Jonathan Gold consistently rates Kiyokawa highly, L.A foodies, at least as represented on Chowhound and the blogs I’ve seen, don’t seem to hold it in equal esteem. Now, I’ve not eaten at all of the top L.A places but I suspect, based on some of the things I’ve read, that Chef Kiyokawa is held in some suspicion because of his aforementioned playful platings (see some of the pictures from our last full-on omakase meal) and some of his non-traditional flourishes/garnishes*. I have a suspicion that some subset of American sushi enthusiasts have an image in mind of a type of austere sushi chef who serves high quality fish in a simple, no-nonsense, even gruff manner. Both in his personal presentation (see the picture in which he is melting the truffle butter) and in the way he presents his fish Chef Kiyokawa doesn’t fit that description. But the fish itself is serious as is his attention to detail (as I said, he even grates fresh wasabi specifically for each piece of nigiri he serves). And whatever your expectations of a Japanese sushi chef might be, the exquisite, whimsical, (almost Rococo at times) miniaturist aesthetic he deploys is very Japanese as well. The food is a pleasure to look at as well as to eat, and if you feel the first pleasure detracts from the second, well then, that’s just too bad. *To be fair, I’ve seen some references to complaints about the rice at Kiyokawa; my own sushi pleasure is so fish-focused I don’t quite care so much about the rice (it’s certainly not bad). This entry was posted in *Food, Los Angeles and tagged Japanese Cuisine, Kiyokawa, Los Angeles, Omakase, Sushi. Bookmark the permalink. On the off chance that anyone is reading my Kiyokawa reviews and possibly weighing whether to go there, the restaurant in its current form (if it’s still open) is not the one I reviewed. It’s now called Go by Kiyokawa but Satoshi Kiyokawa’s involvement with it ended some years ago and all reports are that it went rapidly downhill fast. I don’t know where Chef Kiyokawa is now but it’s a shame that his name has continued to be associated with a restaurant that is not up to his standards (I assume this is for contractual reasons of some kind). Some more discussion of the change here.